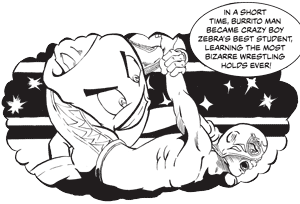 Rawking and Evil Robot are two professional wrestlers employed by the Strength Monsters Wrestling Federation. 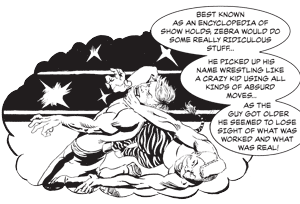 They are among the last wrestlers alive with an authentic knowledge of Catch as Catch Can Wrestling, an older and less known Wrestling style. Rawking and Evil Robot find their favorite taco shop, Carlos Family Tacos, in a dire situation and nearly forced out of business by the much larger T.M. Tacos franchise. T.M. Tacos has plans to shut Carlos Family Tacos out of Business for good by looking to dominate the upcoming Eat-A-Burrito Competition with former pro-wrestler and Luchador extraordinaire Burrito Man. Do Rawking and Evil Robot have what it takes to defend their local taco shop and reclaim their legacy and face the sinister Burrito Man in an all out war? Find out by downloading this inaugural issue today! 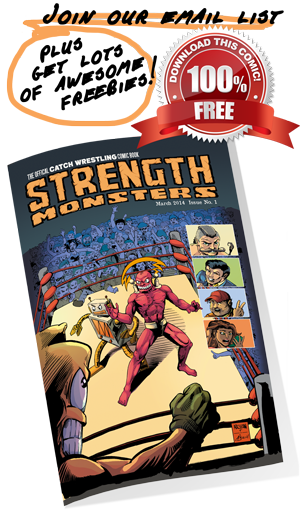 Enter your name and email in the box above and you will be sent a link to download the entire first issue of Strength Monsters for FREE! You will continue to receive a monthly email from us about our latest comics, news, and more freebies. Opt out at any time.